Advertising loves history. Ever hungry for images, advertising agencies plunder the past with gusto. You know the formula: a pop soundtrack over a piece of ‘vintage’ footage shot last month to whet nostalgic appetites. Retro-styling is a surefire way to lend a limp product a dose of commercial Viagra. In a mood of mea culpa, David Buonaguidi – creative director at Karmarama, the agency behind the kitsch ‘Elite Designers Hate Ikea’ TV ads – once admitted, ‘In advertising you are called original if you thieve something first.’ But what of the history of advertising? While the shelves of Britain’s booksellers seem to groan under the weight of yet more heavyweight books mapping the past, present and future of graphic design, our understanding of the history of advertising remains negligible. Of course there are books on the subject. This summer saw the publication of All-American Ads 80s (Taschen), yet another pile of seductive retro images in a glossy package. Each new book is food for the advertising industry and graphic design’s cannibalistic approach to the past. Recently, this insipid literature has been given a boost by Clive Challis’s hagiographic account, Helmut Krone: the book (The Cambridge Enchorial Press), of the career of Helmut Krone, art director at Doyle Dane Bernbach, the New York agency famous for its witty Volkswagen ads in the 1950s and 1960s. In 257 pages of densely set text, Challis presents a forensic account of the art direction of every ad in Krone’s portfolio to demonstrate his ‘rule-breaking’ genius. And since Judith Williamson’s pioneering Decoding Advertisements of 1978 there has also been a steady stream of heavily theorised texts winging their way out of university sociology and media studies departments. Armed with specialist toolkits fashioned from structuralism and psychoanalysis, we now know how to dismantle the image world in which we live. I’ll never be fazed by a tampon advertisement again. But what of the history of the advertising industry and its products? What do we know about how and why the imperatives to consume that have sought our attention for at least two centuries were made? An interested reader would struggle to find out much about the formation and growth of the advertising industry in Britain. The last methodical study of the subject, Terry Nevett’s Advertising in Britain (William Heinemann, 1982) was written almost a quarter of a century ago – long before ambient advertising, ‘guerrilla’ campaigning and subvertising of the 1990s, let alone the retro sensibility which took hold a decade earlier. When and why the modern advertising agency took shape are not simply academic questions. Our view of the ‘cocacolanisation’ of Europe might be somewhat different if we know that fears of transatlantic commercialism are already over a century old. And understanding how and why the Advertising Standards Authority was formed in Britain in 1962 might tell us much about why this industry-initiated body continues to be a stooge for advertisers looking to create cheap controversy. Moreover, it is a commonplace to claim that advertising marches to a progressive beat becoming more sophisticated, more persuasive and more subtle while earlier forms of advertising were pragmatic and overt. But where does this myth originate? How can we be so sure? After all, this argument serves no one except for the advertising industry itself. So how should the history of advertising be written? It is worth casting a glance across the Atlantic. There, the industry has attracted the energy of numerous historians and writers, a reflection of the central role of Madison Avenue in national life and consciousness. Dozens of books take their readers beyond the platitudes of style, to map the organisation and growth of consumer marketing from the 1840s on. In her brilliant 1998 study, Advertising Progress: American Business and the Rise of Consumer Marketing (Johns Hopkins University Press), Pamela Walker Laird, for instance, provides a fascinating account of the emergence of a set of specialist roles in the last years of the nineteenth century that are still with us today. In little more than two decades, advertising agencies evolved from humble space brokers into a technocratic industry populated by campaign planners, market researchers, copywriters and art directors. At the same time, they developed a specialist jargon drawn from business theory and the embryonic ‘science’ of psychology to legitimise their role and, of course, their fees. Advertising agencies not only sold the products of the modern business, they promoted a vision of progress so firmly grounded in consumption that it reset the horizons of the American Dream within almost exclusively commercial limits. Alongside such rounded accounts mapping the industry and its chief actors, other historians have produced rich studies of the relation of politics to consumerism, and the transformation of the American landscape by advertising. A good example of this is Catherine Gudis’s pacy 2004 account of the relationship of billboards and automobiles, Buyways. Adam Curtis’s television programme, The Century of the Self, made for BBC TV in 2002, was a tour-de-force account of the twentieth century’s fascination with the self. Connecting the rise of public relations in America in the 1920s to the interests of authoritarian regimes in propaganda in the 1930s and the narcissistic promise of postwar consumerism, Curtis’s argument came up to date with a sharp critique of the hold of advertising and marketing on public life in Britain and America today. When Blair and Clinton turned to the focus group – a phenomenon invented by psychoanalysts – they set out to mould their policies to people's inner desires and feelings. We all know that advertising has shaped the mental and physical environment in which modern life is lived: these studies, taken as a whole, have shown how this happened. Moreover, placing relatively little emphasis on matters of aesthetics and style, they have opened a window on advertising’s hubris and megalomania. Ernest Dichter, the influential Director of the Institute of Motivational Research in New York in the 1950s and a key advocate for the application of psychology to the practice of advertising, believed that the spread of modern advertising would win the Cold War for America. By contrast the history of advertising in Britain and in fact much of the rest of Europe remains largely unwritten with a few noteworthy exceptions, most recently Paul Jobling’s Man Appeal: Advertising, Modernism and Menswear (Berg) on the 1920s and 1930s. Of course, in this vacuum the advertising industry has stepped in to offer a history of itself. In 2002, the D&AD published a glossy account of the achievements of its membership (accompanied by a survey exhibition at the V&A, see Eye no. 47 vol. 12). Rewind (Phaidon) is a chatty, anecdotal book which maps novelty in graphic design and advertising over the 40-year existence of the body, with some recent detours into architecture and product design. If, as its critics and supporters tell us, advertising can be an accurate social barometer – mapping our needs, dreams and fears – this is not it. What it is, is an upbeat record of what D&AD would like the industry to be (this is, after all, a catalogue of D&AD prize-winning images). Rewind displays all the signs of what sociologist Sean Nixon in his ethnographic study of the day-to-day operations of high-profile London advertising agencies, Advertising Cultures (Sage), calls the ‘the cult of creativity.’ In a narrowly circumscribed field – limited by the interests of clients and their reliance on market research, and operating within a relatively narrow set of genres – advertising creatives have developed strategies to lever high status and higher remuneration. Creativity is measured in remarkably conservative and old-fashioned terms. Innovative creatives win awards, sometimes from D&AD; they create a stir by tinkering with the well established conventions of format; and they build reputations for novelty. Ultimately, the cult of the ‘creative’ seems much like the cult of the artist in the nineteenth century, predicated on the myth of visionary genius. If Rewind demonstrates one thing, it is that a critical history of the ‘creative’ both as a professional role and as a rhetorical figure needs to be written. Creatives occupy, it seems, a relatively new role within the agency. (A fact, perhaps, reflected in the clumsy co-option of an adjective as a noun to describe the jobs of copywriter and art director). How and why did they come to occupy such a prominent position? Is Nixon right when he claims that the high prestige which attached to 1980s advertising campaigns that tapped deep veins of nostalgia and popular history – like the over-celebrated Bartle, Bogle and Hegarty Levi’s jeans campaigns – shifted power within the agencies? Creative departments increasingly had the top hand over humdrum business functions. This would seem to be a significant change. After all, advertising agencies had spent much of the post-war period polishing their business credentials in order to cosy up to the corporation. In the 1950s the Institute of Practitioners in Advertising even recommended that its members should take exams to demonstrate their professional bona fides. Surely creativity was important in the tweed-suited years, but what symbolic capital did it generate? And, taking a wider perspective, what was it about the economy and culture of Thatcher’s Britain that made costly brand-building campaigns – the hallmark of the creative department – more attractive to advertisers than the steady promotional techniques which had been the staple practice of the profession? None of these questions was answered by Rewind. Nor would you expect them to be. It was, after all, a work of self-publicity rather than self-analysis. But it is worth pausing to think about D&AD’s particular interests in marrying advertising and graphic design. In 1995 American critic and historian Steven Heller stressed that graphic design repressed its historical relations with advertising in order to emphasise its status as ‘an aesthetic and philosophical pursuit’ (‘Advertising: mother of graphic design’, Eye no. 17 vol. 5). 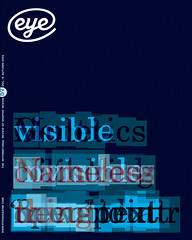 Three years later Rick Poynor compressed this idea into three blunt words, ‘Design is Advertising’ (Eye nos. 29 and 30 vol. 8). Poynor wanted to make a polemical point. In a political climate then being shaped by global protest, anti-consumerist movements and ‘culture jamming’, his assertion was an accusation designed to shake graphic designers’ deeply held self-image as agents of culture and progress. Nevertheless, it is important to assert that while much graphic design is advertising, graphic designers are not ‘creatives’ in the sense used in advertising. Graphic design and advertising have different histories and cultures which still shape their professional identities today. French sociologist Pierre Bourdieu described this as ‘habitus’, his term for ways of living and thinking which define social groups. Like a gene, habitus develops across generations and, while it does not shape behaviour in some kind of mechanical way, it is what enables us to make sense of the world in which we live. For Bourdieu, a Marxist, the question was not just how does a particular habitus form, but why? The point that I am making in this brief excursion into sociology is that the professions of graphic design and advertising have different ways of being and thinking. The reasons why, for instance, it is coherent to talk about anti-capitalist graphic design, but not about anti-capitalist advertising is not just a matter of commercial ‘realities’; it is also a reflection of something deeper. Taking the long view, graphic design has been shaped by a different set of social, cultural and moral imperatives than those governing advertising. An issue such as that of legibility in the era of digital type which pulsed through graphic design in the 1980s and 1990s was laced with a moral discourse about serving audiences that goes back to the end of the nineteenth century if not earlier. In the early 1900s for instance, German left-wing critics and designers objecting to the spread of kitsch which had been formulated – after Marx – as the rise of commodities in which exchange values had overtaken all usefulness, promoted the idea of the sachplakat (the object poster). This minimalist form of advertising rejected the emotional appeal of ornament and sensational rhetoric in favour of the hyper-real representation of the product. This was a move by designers and their allies to moderate commodity aesthetics. Another variety of this view was expressed in the mid-century when Swiss School designers advocated clarity and the use of ‘documentary’ photographs as a means of resisting the encroaching values of tawdry commerce. Neue Grafik editorialised, ‘We come to […] the question as to whether the effect of advertising is intellectually sound. If a graphic designer is not clearsighted and sensitive in this respect he might do great harm’. Whether or not those arguing about legibility in the 1990s recognised this intellectual heritage does not matter (or even where they stood on the question itself); the terms of the debate were set before they were born. This was habitus at work. If I am right, the histories of graphic design and advertising need to be untangled. Only then can we understand better how they are interconnected. As it is currently written, the history of advertising – outside America – is inadequate. For it to improve, historians with greater interest in cultural economy (i.e. in the interface between political economy and culture) and less in design are needed. At the same time, for this to happen advertising agencies and their clients will have to be prepared and interested to open up their records (already scarce in an industry obsessed with novelty) to scrutiny.